Hello, all you marvelous readers! WOMYN is hosting a submission-writing party TOMORROW from 8-10PM in the Center. 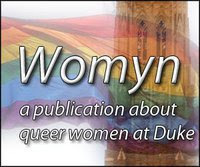 The deadline for submitting your ever-fabulous perspectives on being a queer woman at Duke is this Friday, September 16. But, writing those submissions can be very difficult, which is why WOMYN has decided to help create an atmosphere that makes writing fun and communal. Because, really, we are all part of such as strong and dynamic community, and WOMYN is a tangible symbol of that community. Therefore, it makes sense that we all share in the writing process - to cheer each other on, make suggestions, and otherwise provide a supportive environment. But wait! There's more! If you come to the party, you will also receive food, FREE with your attendance! In the meantime, I urge you to keep spreading the word about WOMYN. When it comes down to it, WOMYN is both a record of our community and a conversation among community members. We need as many voices as possible to be included in that conversation. So, please take a WOMYN bookmark to give to a friend, send an email, share a copy of the first issue - we will all benefit by encouraging others to submit. Additionally, for the artistically-inclined, WOMYN is looking for an awesome new cover design. We want this issue to be as slick as the first! You can send your submissions (art and otherwise) to womynatduke@gmail.com. We look forward to seeing the wonderful things you have to offer!